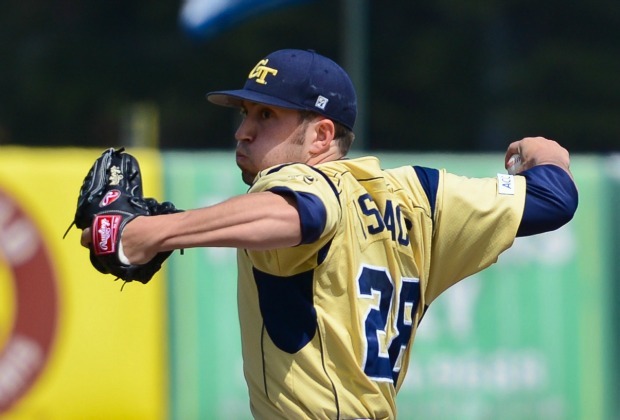 While the wins haven’t come at the pace they did at the start of the baseball season, the Georgia Tech Yellow Jackets have continued to get strong play from several players at the plate and on the mound. Kyle Wren has maintained a 17-game hitting streak through April 2, which leads the ACC. He is also coming off a week in which he went 10-for-15 at the plate, a .667 average. He has maintained a batting average over .400 the entire season and is among the top five in average in the conference. While Buck Farmer and his perfect record have been the story from the pitching side of things, there was another Jacket pitcher, Dusty Isaacs, who stole the spotlight away from Farmer this week. In the first game of Saturday’s doubleheader against Wake Forest, Isaacs struck out eight and allowed just one hit over seven shutout innings in the Jackets’ 8-1 victory over the Demon Deacons. His performance was enough to be named ACC Pitcher of the Week as he earned his fourth victory of the season. Another highlight of the weekend was Daniel Palka, who homered in four consecutive games last week, bringing his home run total to eight for the season. Even with the strong individual performances, the Jackets stumbled a bit in the final game after a late-inning rally came up short in an 8-6 loss. Two three-run home runs from Palka and A.J. Murray turned a blowout into a close game, but the Jackets couldn’t quite complete the comeback. The Jackets then traveled to Macon to take on Mercer. The Bears have managed an impressive start in the Atlantic Sun Conference. Tech dug itself into a hole early and couldn’t recover after allowing the Bears’ bats to get hot. Tech fell 10-1. Tech would bounce back with a 9-1 win over Kennesaw State Wednesday. Jackets’ catcher and third baseman Alysha Rudnik earned ACC Player of the Week honors for the second time this season after hitting a scorching .750 from the plate. The junior went 9-for-12 with three doubles and a home run over four games. She contributed much of that in a crucial series win on the road at N.C. State, helping to improve the team’s record in conference play to 4-2 despite hovering around .500 overall.